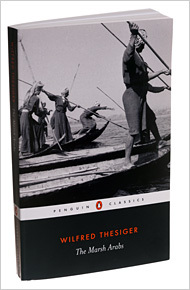 Many had a bit of a sticky start with The Marsh Arabs by Wilfred Thesiger. A couple in our group found this tall gaunt Etonian arrogant, presumptuous and tedious, not to mention chauvinistic. One reader was prompted to say ‘Where are the women? Where are the girls?’. If you don’t learn to like Thesiger, you probably won’t like this book because his perspective is the only one you’ll get. The book doesn’t pretend to be travelogue, history, anthropology or memoir, but defies categorisation. In spare elegant prose, it recounts one man’s experiences, learning about a very foreign culture, thousands of years old, one friendship at a time. Thesiger lived with the Marshmen for most of the 1950s and explains simply, “I spent these years in the Marshes because I enjoyed being there.” Guided by his canoeboys he traveled through the southern area of the Tigris and Euphrates rivers from village to village where he stayed in graceful cathedral-like guest houses made of reeds called mudhifs. He helped when he could using a box of basic medical supplies, learned as much as he could about their customs and adaptations to their rather unpredictable environment, and frankly discussed drastic changes happening to the younger generation as literacy and the modern world encroached on their traditions. Some struggled at first with the unemotional style; most if not all of us found the names and places rather confusing; the descriptions of reed banked waterways could be repetitive. Nevertheless, the majority found the environment and culture, his friendships and adventures, fascinating and rewarding. A great introduction by Mike helped us understand Thesiger a bit better, filling in details about his life. He brought us more of Thesiger’s wonderful photography and encouraged us to read his most famous work, Arabian Sands, about his audacious journey across the ‘Empty Quarter’ of Arabia.